Where does dust come from? You may be wondering that after wiping a fine layer off the coffee table you swear you just cleaned the day before. It doesn’t matter if you live in the city or the burbs, dust will find its way into your home—and it’s not going away anytime soon. Dust is a combination of very fine, dry particles of matter found in the local environment. 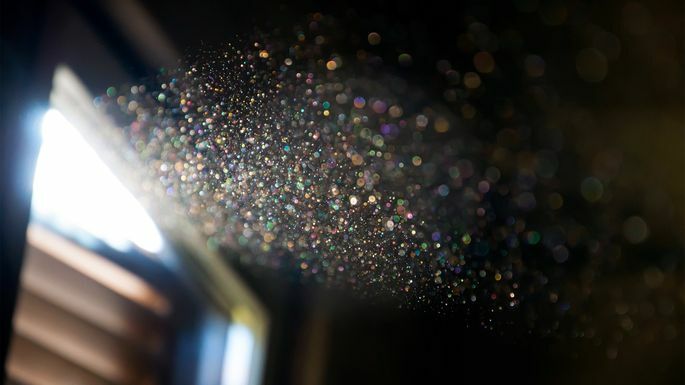 These particles are lighter than air and become visible only when they accumulate. Dead skin cells: Gross but true, we all naturally shed to generate new skin. Pet dander: Like humans, pets naturally shed their skin. Textile fibers: Your carpets, bedding, and clothing simply break down over time. Dust mites and insect droppings: OK, now we’re really grossed out. Microscopic arachnids feed on human skin cells and release droppings. Soil or plant pollen: These are especially prevalent in spring. Pollution: This heavy, black dust comes from the output of diesel fuel. Mold spores: These come from soil and decaying vegetation. No matter how many feather dusters or sweeper mops you keep on hand, it’s impossible to completely rid your home of dust. Keeping windows and doors shut may prevent more dust from coming in, but it also prevents dust from blowing out. Your best defense is to dust once a week, especially in hidden or hard-to-reach areas. Here’s a list of areas most people forget to clean. Fans: Be it an oscillating fan, box fan, or ceiling fan, fan blades are a beacon for dust collection, says Kelly McClenahan, a storage and organizational expert at Price Self Storage. Carefully run a damp cloth over each blade to clean it. Heating and cooling vents: Floor and ceiling vents are very susceptible to excessive dust. And, yes, this can contaminate the air you breathe. Clean the outside of vents by placing a damp cloth over your finger and running it over the vent and any slats. Clean inside air vents by rubbing your vent registers with a dryer sheet. Houseplants: Your favorite ficus will accumulate some amount of dust over time, especially if it has larger leaves. You want to be delicate with the leaves, so use a hair dryer on the low and cool setting to blast off dust, says Rae Dolan, a real estate agent in Katy, TX. In addition to getting clean, the plants will perk up after a good dusting because they will be able to absorb more sunshine. Media players and devices: Dust on an electronic device equals problems because it can get into circuits, accumulate on sensors, and disrupt the flow of electricity. Use a microfiber towel to wipe down your electronics. To reach inside the nooks and crannies, use cotton swabs and a spray cleaner that’s safe for electronics. Smoke alarm: Homeowners should clean their alarms once a year to keep them in good working order. Use compressed air or a vacuum cleaner hose to clean the openings around the alarm’s perimeter. Then wipe the outside with a cloth moistened only with water, as cleaners may damage the alarm. Bathroom tiles: Yes, there is such a thing as “towel dust.” Towels tend to shed fluff, which sticks to the walls in a humid bathroom. Wipe down bathroom walls with a dry microfiber towel while the room is still damp. Be sure to vacuum underneath all rugs on a regular basis. Blinds: Whether you have miniblinds, accordion blinds, or slat blinds, they can benefit from a good dusting. Try putting a sock over your hand and running it horizontally over each slat. Outlet covers: If left full of dust long enough, they can develop a dirty-looking film. To clean them, remove the covers and wipe them down with soap and water. Let them dry thoroughly before putting them back on the wall.